This meet-up is FREE sponsored by The Point Church and Community Center. We will be discussing many topics such as when to start, companion planting, deep mulch, composting, edible landscaping, back yard chickens and more. If the continuing food price increases are getting you down start producing your own. You do not need land to grow your own food. There are tips and techniques that you can even grow indoors in a window or even without. With the drought in California fruit and vegetable prices are going to go up. Recently California ranchers stated they will be liquidating many of the herds. This means increased prices on beef as well. Tired of all the chemicals in and on your foods. Grow your own and know exactly what is in it. The slides are for classroom use only and no notes/handouts provided. If you would like a copy of the slides you can purchase them before or after the class $5. Cash or via PayPal wolfbeachfarms-at-gmail.com There are lots of charts and graphs. All information is available for free if you know where to look. No audio or video recording allowed. Recently I hosted a tour from the great folks from Aquatic Design. 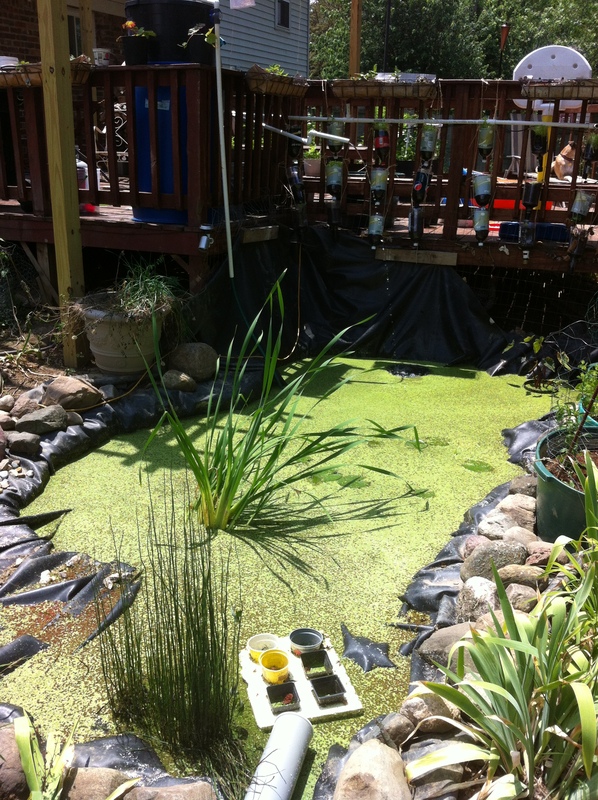 A local company that sells, installs, and services ponds and other waterscapes. 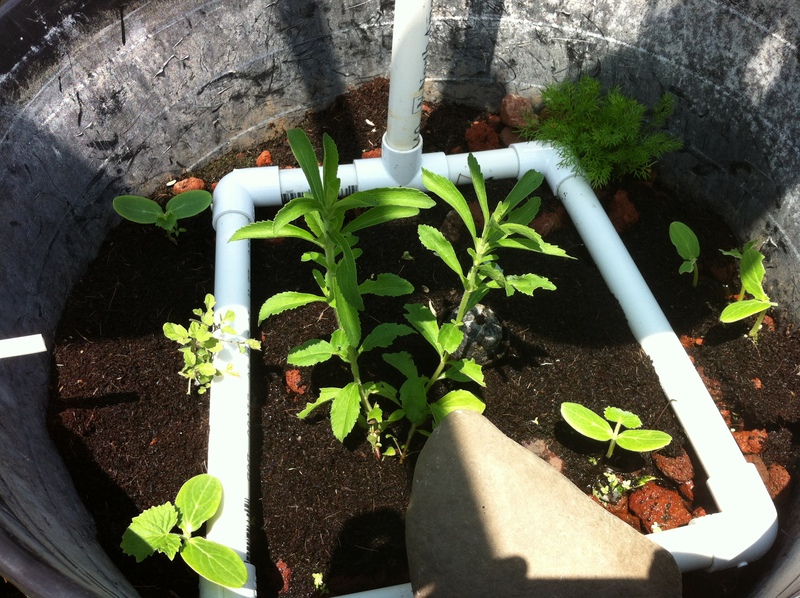 They are beginning to enter the world of aquaponics, and wanted to see some real examples from the area. Granted my system are no commercial operation, nor are they often pretty to look at. I mean, I use kitty litter boxes as biofilters. It was cheap (free), I felt accomplished, I did it myself, it works, I can replace parts easily and inexpensively (free). The tour was a learning experience for both I felt. 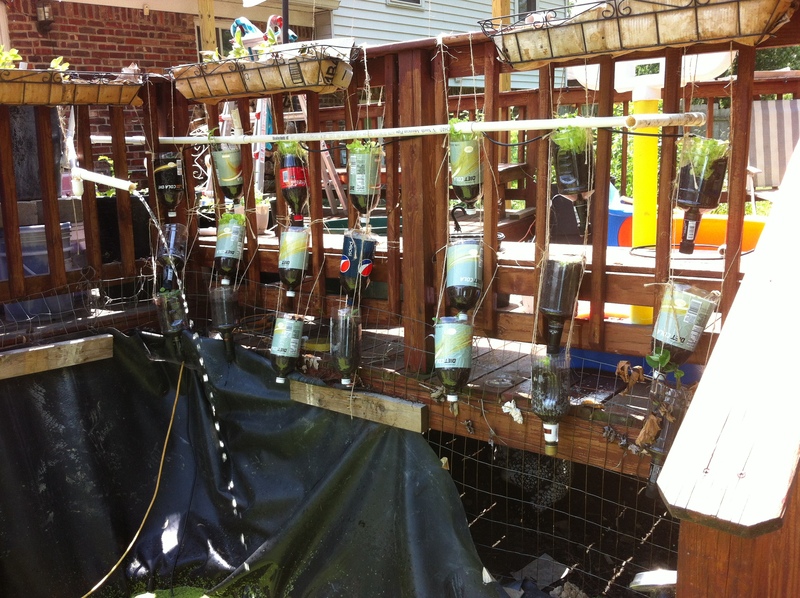 I shared my experiences and lessons learn, often the hard way, and what I, as a new consumer, or someone just getting into aquaponics might be asking, looking for, and solutions to some problems I encountered. I have been a past customer of Aquatic Design and probably continue to be. It was a great feeling when they asked me to come see their new building which will house their aquaponics examples and configurations and maybe give advice as they were setting things up. I felt like all my lessons learned the hard way, shortfalls, and set backs were for a reason. I didn’t need to go to a course, an educational institution, or pay a big chunk of money for the education I had experienced. 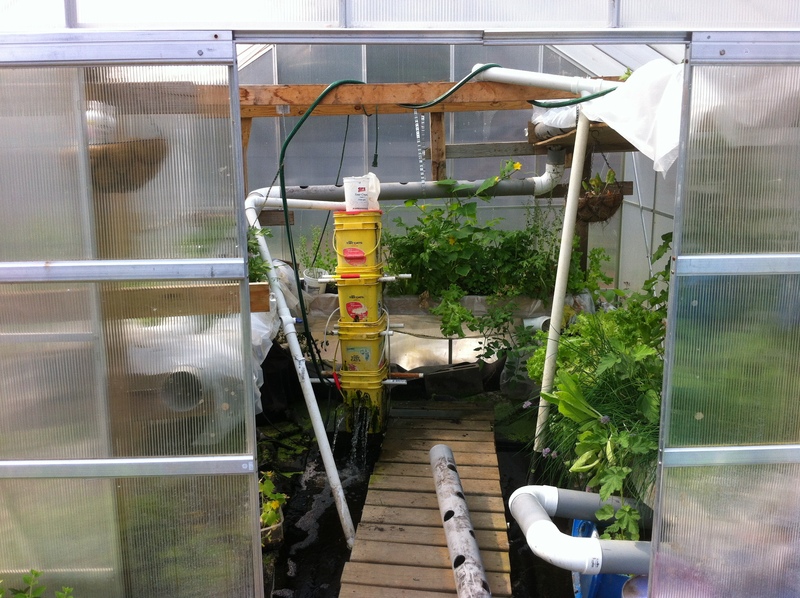 So when I tell people you don’t need to spend a ton of money on videos, books or classes, to learn about aquaponics I come speaking from experience. While they were here I talked about the largest system 4500 gal outdoor down to my smallest system 30 gallon. As of now we have 4 systems in operation. 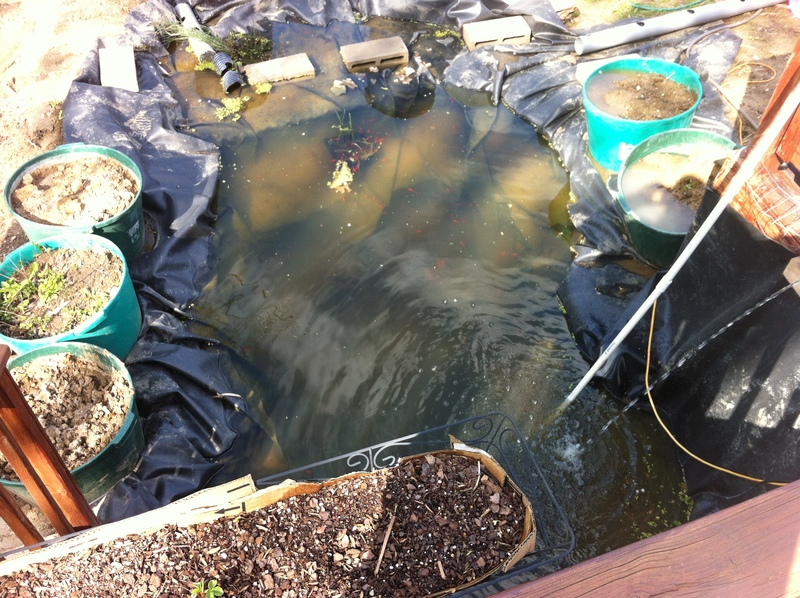 4500 gal outdoor pond, 3000 gal currently in a greenhouse but being converted to hoop house, the newest a 275 gal poly tote in the garage – still under development, and the 30 gal inside our kitchen/dining room. This 30 gal is something many people can put into place for inexpensively, it is a great conversation piece, it is entertainment, it is educational for kids of almost all ages, and in my mind, it’s really cool. 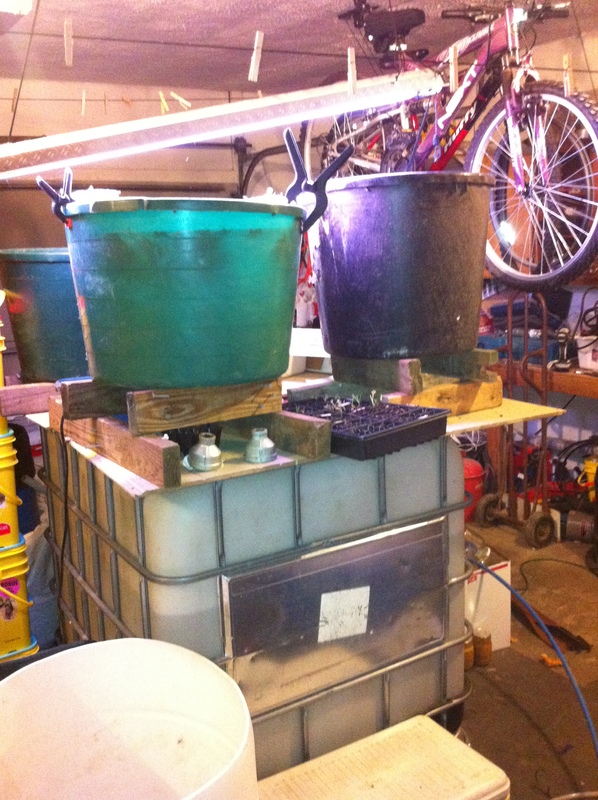 I made this system a continuous recycling flow system. I got the aquarium from a friend who was throwing it out. Free. 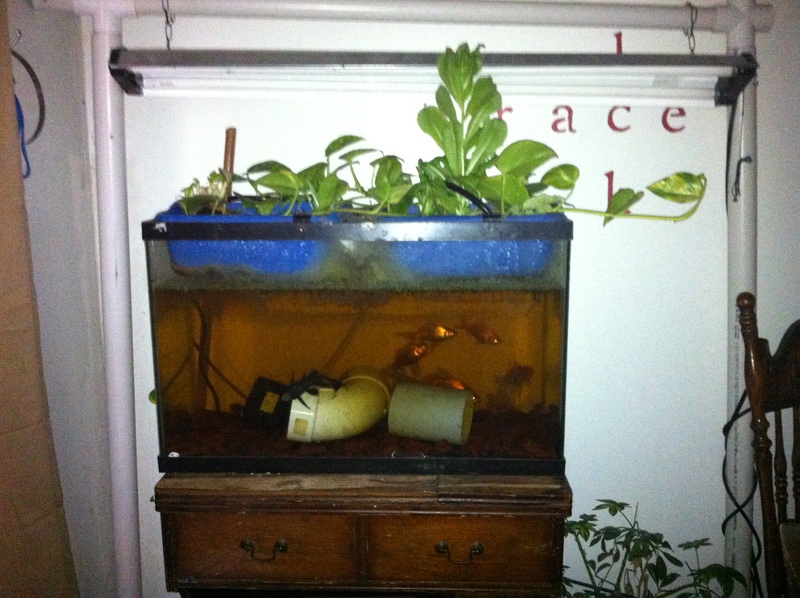 You can look on Craigslist, Goodwill, or friends and family for aquariums. Many times people would love to get rid of them. Bonus if you get pumps or other stuff with it you can use later. The rocks on the bottom of the tank are landscaping lava rocks. Mine were free. The previous owner of my current house landscaped with it. I hate the stuff in the yard. Again free. (well, if you count the $10 I pay kids to collect if they want to earn money). 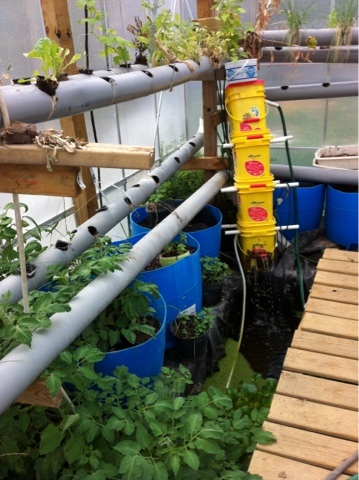 Fish habitat or hiding spaces I used left over PVC pipe from another project. Find them at building sites, or look around. It could be old Tupperware, or food containers just something for the fish to swim in and out of. I actually paid for the submersible pump. But it was 75% off so I think I paid $10. Some big box stores will clearance pond and fountain pumps in fall and early winter. Just watch for sales. Or it may come with your aquarium you got for free. You can watch Goodwill and I have seen fountains or other pumps on occasion. Worst case $30 or so retail price. The grow beds are wash bins. This was a Goodwill special and I only paid $0.25 each. Dollar Store has them for a buck. The grow media, lava rock again. Do not pay for the extruded clay. Not worth the extra money in my opinion. I drilled holes in the bins and had the pump take water from the tank, pump into the bins, and out the drainage holes in the bottom. It is important to add more holes than you think is necessary, because over time roots and other gunk can fill the holes and it will overflow. Another important lesson, add overflow holes below the lip. VERY important, if you don’t, and your drainage holes become clogged, your tank will overflow, and all your water will go onto the floor. Want to know how I learned this? Because of the location in my house the system doesn’t get enough direct light to support plant growth. So I added a florescent light. The light, the stand, and the bulbs maybe $30. I made the stand out of PVC pipe and fittings. I could have just as easily hung from the ceiling and saved the cost. I use this system sometimes when I to talks or presentations and the stand is needed for display purposes. You need to use a bulb that will hit 2700K to 6500K, read the labels on the bulbs. Choose a T5 over a T12 type of bulb. T5 is higher intensity over T12, and more efficient use of energy. The fixture should match the bulb type, T5 bulbs fit in T5 fixtures. You could use HID, or LED. But for the money and energy I found fluorescent was just fine. HID gives off too much heat, and LED was too expensive. With fluorescent lights you want them 2-6 inches from the plants. The light needed for photosynthesis loses its intensity after 6 inches using fluorescent bulbs. 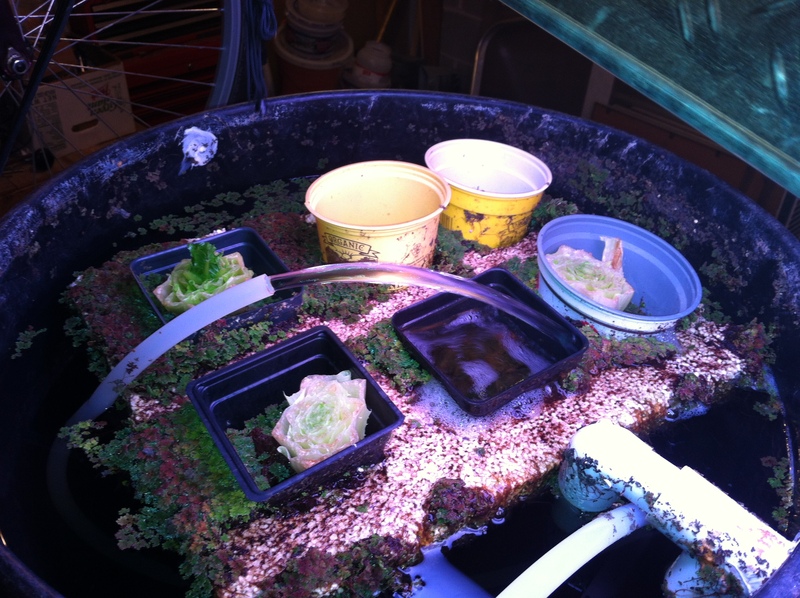 HID can be several feet away because it is a more intense light (and 2-6 inches will literally cook your plants). We have some kale, some medicinal plants, and a philodendron, which are poisonous, but we can split and propagate to other containers to sell, or help purify the air in the house. 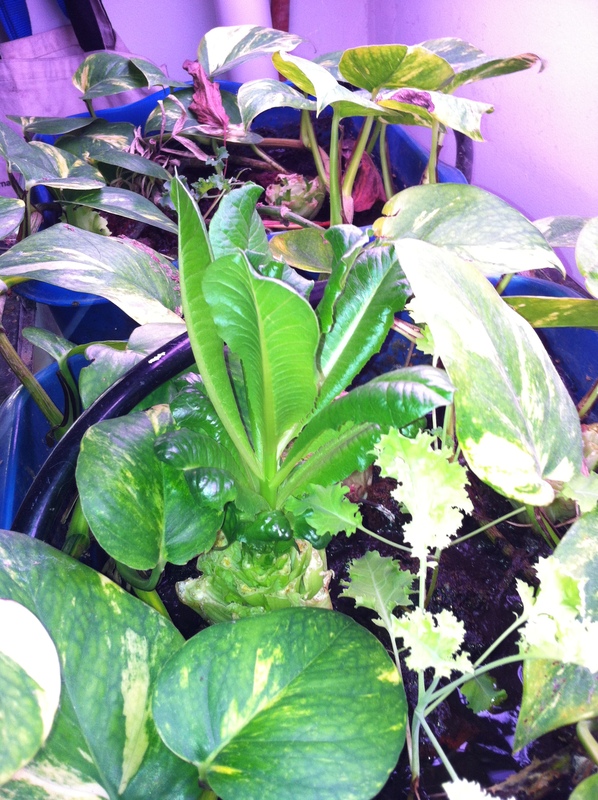 We always leave the main plant so that there is always a plant purifying the water in the system. We have had tomatoes, cucumbers, spinach, parsley, basil, cilantro, marigold and more. You can get plants from what many people think of wastes. We have started planting the bottoms of romaine lettuce. It was originally just an experiment, but now we are just harvesting the leaves for food. Celery is another plant that can be planted from the hearts when you buy them at the store. Here is another list of plants you can plant from cuttings when buying food. You can also regrow scallions, 3+ years of cuttings from the same plant. I got feeder fish from the pet store $0.12 each. I got a plecostomus (sucker fish) to eat the algae off the sides so I didn’t have to do it. $2.00. 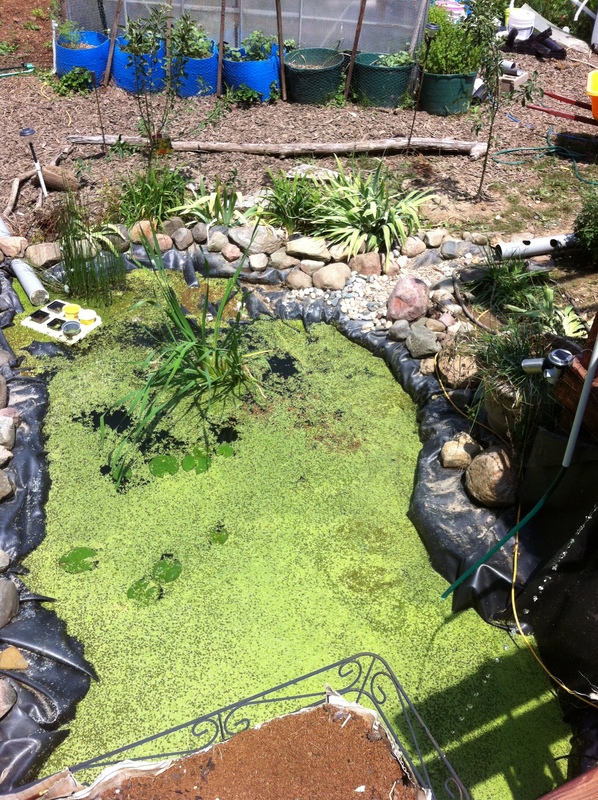 I feed the fish azola or duckweed I grow myself. So feeding them is free. From an educational standpoint there are so many things to learn. From the 2 year old feeding and watching the fish, to adults and learning about the nitrogen cycle. There are lots of lessons to be learned. Want to learn more. Contact us, or follow us here, on Twitter, Facebook, LinkedIn, and Pinterest. Or come see us in person November 23rd for a full day class on homesteading, growing your own food, preserving your own food and more! Ensure your spot is reserved by registering and prepaying for the class. Schedule your own series of classes with the Be Prepared Series. I made the cover of Prepare magazine! 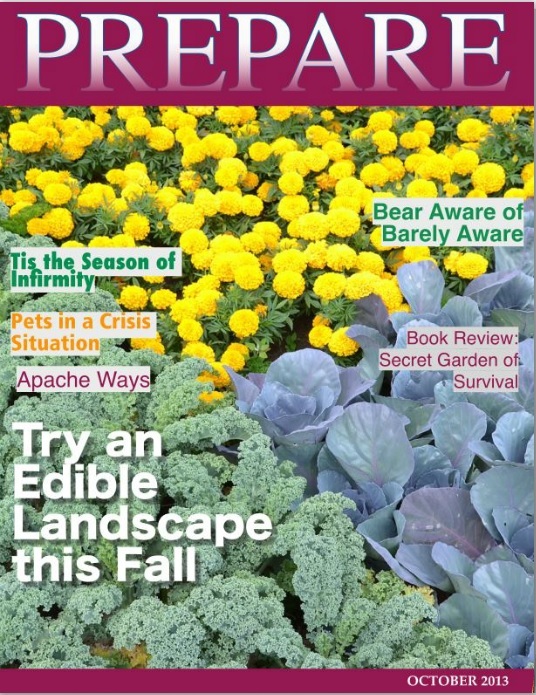 I recently wrote an article that landed me on the cover of the October Digital release of Prepare Magazine. 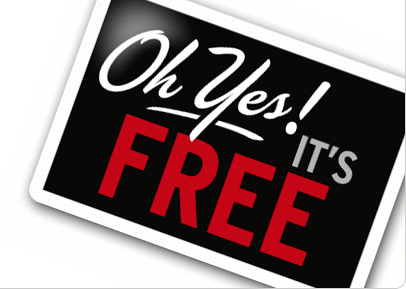 The digital publication is free. Sign up to start getting them. I was going through some of my pinterest finds and thought I would share a few. I found a website http://www.dumpaday.com/genius-ideas-2/simple-do-it-yourself-craft-ideas-52-pics/and you can really dump a day there. I found all kinds of cool stuff I added to my pinterest account. Before long I have used up 1/2 a day looking at some of the cool stuff. Here is where I pin stuff I find. Recently I wrote about homemade cold remedy, and homemade chicken broth. Here is the details on another great herb. Garlic. Garlic is closely related to onion, shallot, leek, chives and rakkyo and has been used by humans for some 7,000 years. Originally from Asia, it has spread all around the world and is used in both culinary and medical applications. Garlic today is available in many forms, including fresh, frozen, dried, fermented, (black garlic) freeze dried, and shelf stable products (in tubes or jars). Personally fresh garlic, or home dried is the best option. Garlic is easy to grow and will grow in most areas of the US. While it can reproduce naturally using pollination from a male and female plant, most grown garlic is used by planting a clove from the bulb. One bulb can plant 10-20 new garlic plants. Garlic is typically planted in fall about six weeks before the first frost and deep enough to not go through many freeze thaw cycles as it will develop mold and rot. It is then harvested in the spring. Garlic doesn’t have too many enemies in the pest world, and is actually great to plant near other plants which are more susceptible. We planted garlic around the roses this year and have noticed a significant decrease in pests. You can also do this around more susceptible plants in your vegetable garden. Garlic can be places fairly close together as long as there is enough room for the bulbs to mature. It likes loose, dry, well drained soils in sunny areas. The best USDA zones for planting are 4-9 but don’t let that stop you from trying if you are outside that zone. If I am close to the zone boundary of a plant I will at least give it a try. There are many techniques using permaculture that can elevate your current zone 2-3 zones higher. Example you can get an extra zone using rocks around the base of a tree to increase 1 zone going from 5 to 6. 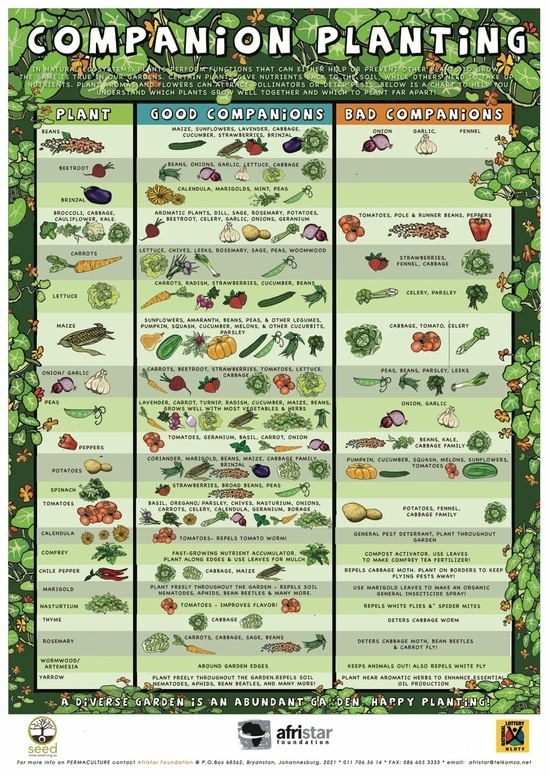 Or a hoop house can get you as many as 3 zones. From 5 to 8. You can not only eat the bulbs or cloves, but you can also eat the leaves and flowers. Both have milder flavor than the bulbs, but is still usable in many dishes. Garlic has so many uses in the kitchen they are almost endless. You can eat it raw, sautéed, roasted, infused in oils, toppings and that is just a few. My favorite (although my family hates it when I do this) is to roast it in a terracotta roaster. Take a bulb or elephant garlic, cut the top, and roast it. Drizzle with a little extra virgin olive oil, and eat right out of the peels. The reason my family hates it, is I already eat a lot of garlic. From adding to my scrambled eggs, with a little goat cheese and herbs, to minced raw garlic topping on my salad, to garlic herb butter on my steak. Eating roasted puts me over the edge. I start to ooze garlic out my pores. I smell like walking garlic for a few days until it works out of my system. Apparently can smell from a few feet away. I never notice. As I said in an earlier post garlic is a component in the cold remedy. Garlic has been known to repel parasites, aid in digestion, antimicrobial, antibacterial, improve respiratory problems, and improve low energy. It has been shown to improve cardiovascular and cholesterol related issues. 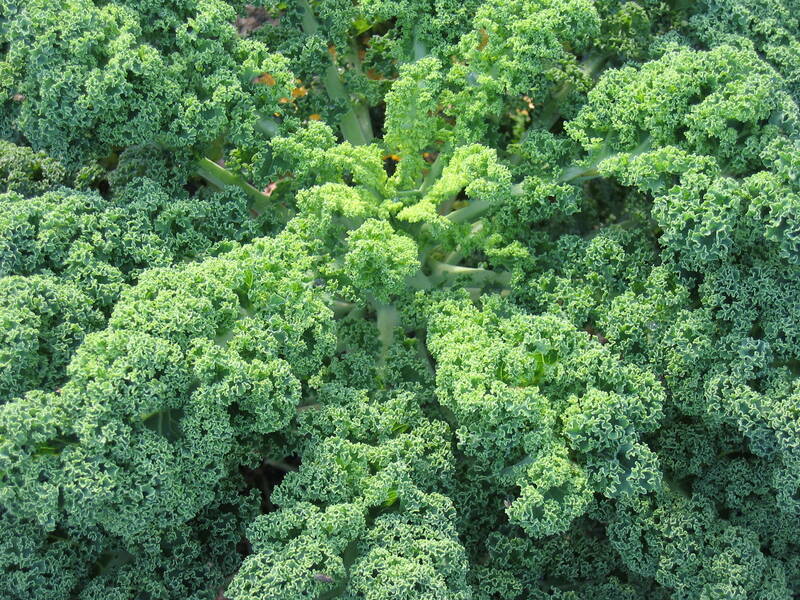 It has shown in some studies to increase good cholesterol and decrease bad cholesterol. Some studies have shown that regular use of garlic in the diet can reduce high blood pressure and even regulate blood sugar levels. During World War II it was used as an antiseptic. Garlic has been used to treat infections, and administered for treatment of chest colds, digestive disorders, and fungal infections such as thrush. Garlic has also been successful in China in treating AIDS patients with certain types of infections and ailments. The sticky juice of the garlic has been used to glue glass and porcelain together, and even as an insecticide in organic gardening with diluted and sprayed over plants. If you are looking to add garlic to your gardens, whether it is vegetable or ornamental gardens, fall is the time to buy. A little bit of garlic can go a long way. 1lb of garlic bulbs can yield 10 lbs of garlic next spring. If not wanting to plant garlic to eat, perhaps just plant as insect and pest control. It is also good against molds, and bacteria and viruses that attack ornamental plants. The less people spray they better off we will all be. While I think of garlic as a wonder plant/herb my family is not so keen on the herb. As my wife says “Everything in moderation, and honey…you over did the garlic again… you are banned until you stop stinking.” Yet I don’t get sick very often, and can eat all kinds of food not good for me (mmm fried foods). My cholesterol is low, and I have really low blood pressure for someone my age, weight, and dietary intake. Now there is an idea. Combine my favorite. Fried garlic in some way? Off to the kitchen to experiment…while the wife is still at work. 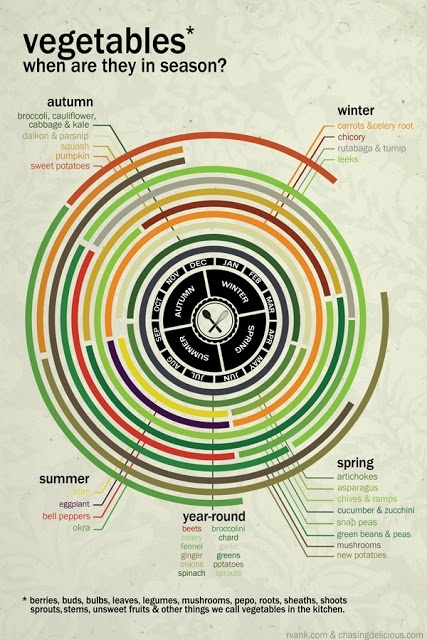 Fall is a great way to put out some additional color and harvest more vegetables. While many plants are starting to go dormant or die off there are several varieties you can plant now that can give color and life to your landscape. 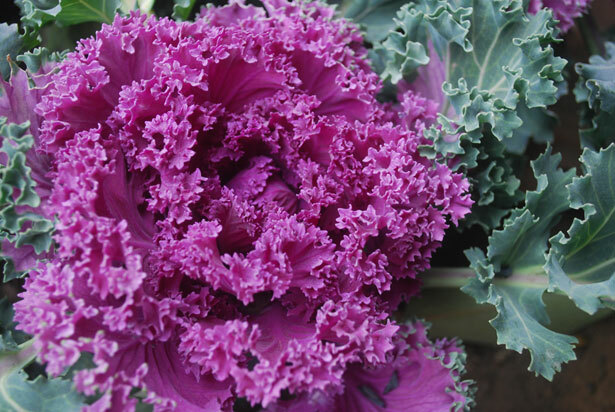 Kale – Kale comes in a few varieties and is cold tolerant. We planted a blue green variety and a purple variety in our front yard. This is mixed in with all the “pretty” flowers. 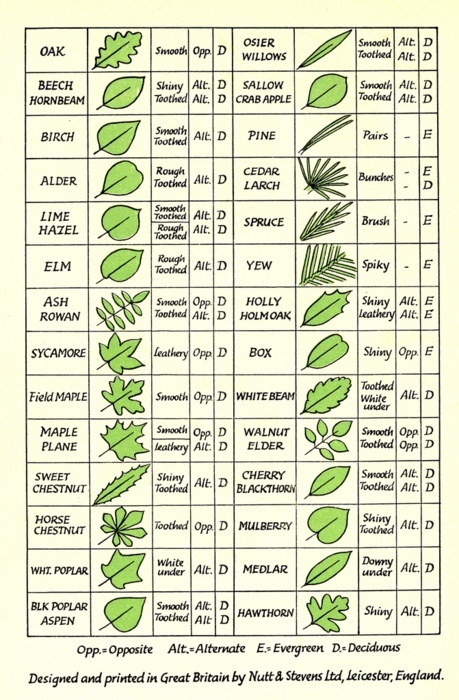 While some varieties are listed as an ornamental you can still eat it. Some studies have shown the more color a plant has the better it is for you. I have heard that you can turn kale into a chip for snacking. 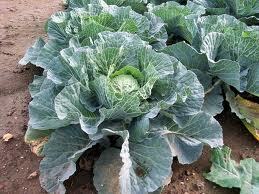 It is also good for juicing, cooked, raw, in salads and is really good for you. This is my first year growing kale. Someone told me about making them into chips as a healthy snack so I thought I would give it a try. If nothing else it can go into the juice mix. Broccoli – While some of our lawn conscious neighbors shudder at planting broccoli in their front yards where all can see, I have no problem. We planted some in the midst of our roses. The bold blue-green leaves I think will be a nice addition to the browns and yellows as other plants pack up for winter. They get about 2-3 feet tall and cover around 2-3 feet in diameter. Bonus we get to eat not only the crowns, but also the leaves AND you can re-harvest over and over. 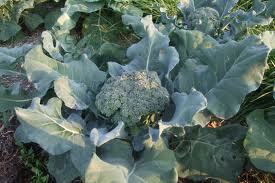 Broccoli is a crop that once you cut will return with another fruit. 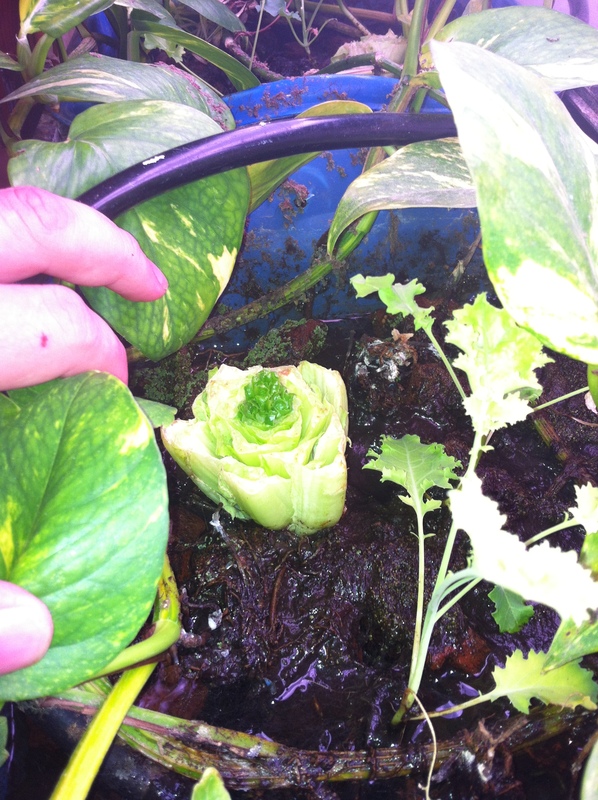 In this case it is the flowers trying to germinate and spread seeds. Once you harvest additional shoots will come up from the cutting. Cut several inches below the crown, at the leaf junction. The next set of crowns will be smaller but still edible. You can do this three or four times during the season. I recently discovered you can eat the broccoli leaves. I added them to my recent batch of V12. It’s like V8 juice but I added whatever I had handy. The 12 ingredients didn’t even cover any herbs I added. Cabbage –I am not a big fan of cabbage. The wife wanted it. I think ever since I tried the fad diet of cabbage soup, I may have burnt myself out on it. She loves coleslaw, and having it raw on occasion isn’t too bad. I may even try my hand ad making my own sauerkraut. 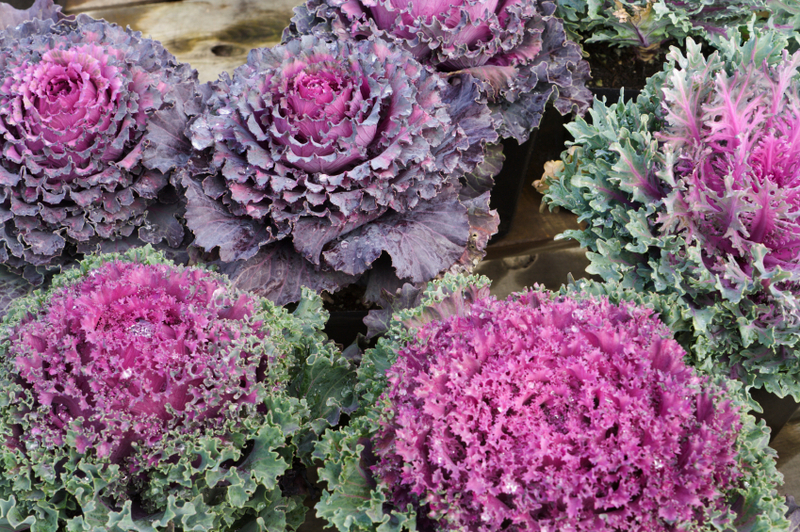 Fall cabbage can come in several different colors. We chose the purple variety and again a dark blue-green. We planted this in our front yard as well intermingled between lily’s and roses. Strawberries – Strawberries are a fall crop? Yep, the everbearing variety will give you additional fruit into fall. We planted ours as groundcover in our front yard. They stay green almost the year, and produce fruit. They do well in almost any light condition. When fruiting our youngest ,2, races out each morning to see if any have turned red overnight. Sadly, as a result I only got a handful of strawberries this year. Between 4 kids I am surprised I got that many. Looks like I will be planting more in addition to the 300 plants this year. 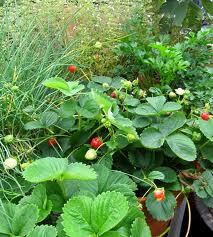 One of the nice thing about establishing strawberries as ground cover is you can get about 100 plants for $20. Wait until spring to plant. Your first year will not have much fruit. The years after that they will do well. Many varieties will spread on their own. 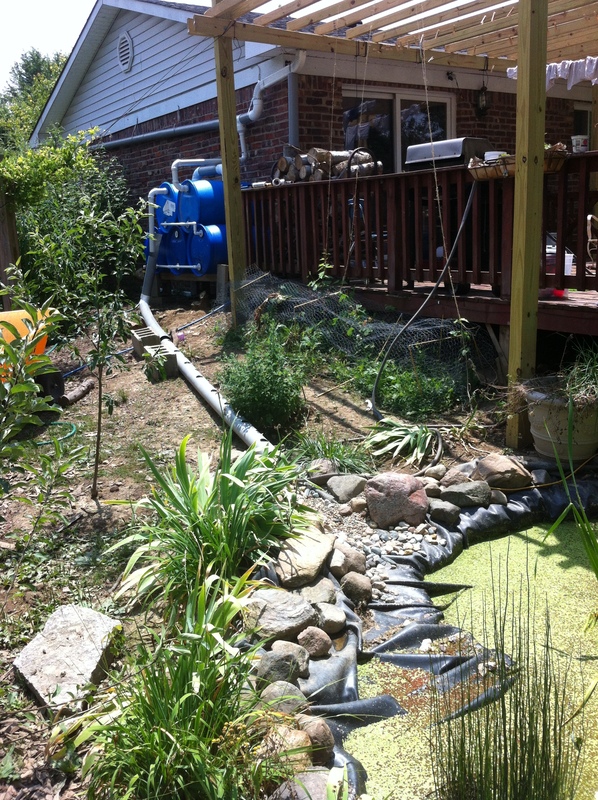 Within a few years you can have a blanket of plants and they will choke out any weed species. Sugar snap peas – We had to put a line around our front garden to keep kids from running through while our strawberries got established. 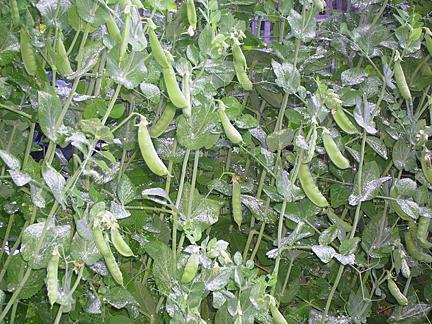 While planting a fall garden we thought, why not use that for sugar snap peas? It will give them something to climb up. So we will have a wall of peas surrounding one garden this year. Edible straight off the vine, super sweet, or we put them in stir-fry, and even cooked alone. 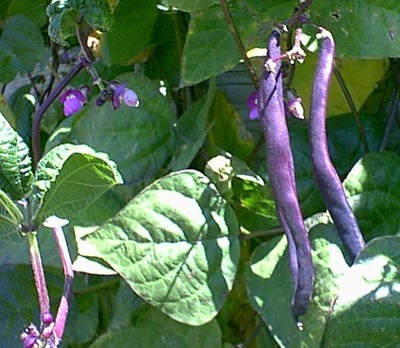 Beans – With the ravenous hoard (our chicken flock) in the back yard we have become creative where to plant things. There is a chicken fence to keep them out of the vegetable garden but we decided to try planting some beans along the front of the house. This was a new experiment and see what would come of it. In between the hostas and the cherry bushes we threw in some bush beans. I chose a variety that yields a purple pod. These should go nice with the purple cabbage and purple kale. It will bring additional nitrogen to the soil at least and hopefully some additional color. While we have many other edible species of plants in our front yard, which is what the neighbors see, this is about all we have this year for our fall crop up there. 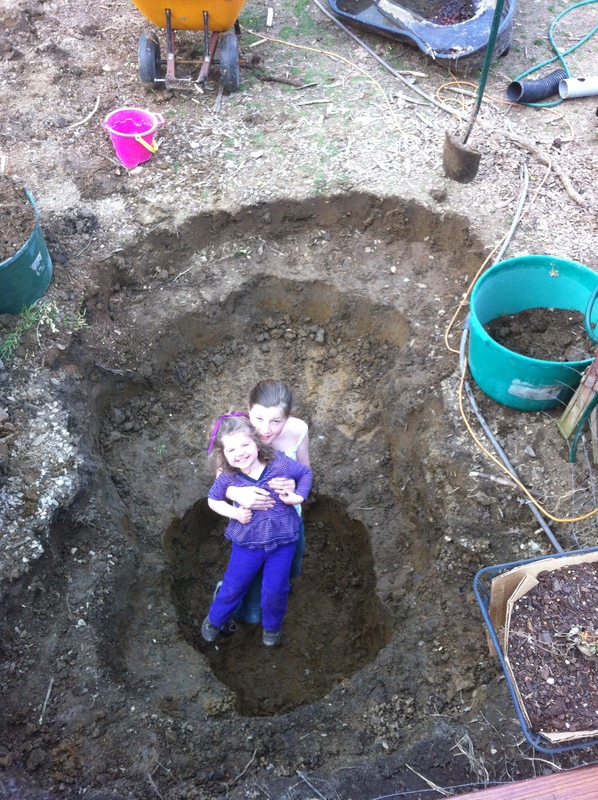 People often ask “What do your neighbors think of you doing all this?” The answer is, I don’t know. I have never stopped to ask them if it is OK to plant in my OWN yard. I think it looks nice, it helps reduce the grocery bill, and they usually they get some overage if we have any. But the bottom line is they don’t pay my mortgage, they don’t put food on our table, and we don’t live in a restrictive HOA. You don’t see me complaining to them about spraying their lawn for weeds, or fertilizing their lawn with toxic chemicals. That is their choice, and this is mine. Lemon Balm also known as Melissa officinalis, spreads and is part of the mint family. Rubbing the leaves you will get a lemon scent hence the name. In summer it has white flowers and is a pollinator attractor. Because it attracts bees so well it was given the name Melissa or Greek for “honey bee”. Lemon balm is as invasive as other members of the mint family and should be planted in containers or other was contained if spreading is not desired. Lemon balm is used in candies, ice cream, teas both hot and cold, and is the main ingredient in lemon balm pesto. In teas it is used as a mild calming agent or sedative. The extracts from lemon balm have been shown to have high antioxidant properties. There have been numerous studies involving lemon balm. From reducing stress in agitated people in a control group to reduction in obesity. Some studies have shown when drank in a tea given to people with regular exposure to radiation, the DNA degradation, and increased plasma levels. While it is known it inhibits the thyroid medication thyroxine it however inhibits antithyrotropic activity and may lead to treatments for Graves’ disease or hyperthyroidism. The extracts from lemon balm have show to improve mental performance and even shown positive results in testing with Alzheimer’s patients. It has both antimicrobial and antiviral properties and has shown to be effective against herpes simplex. 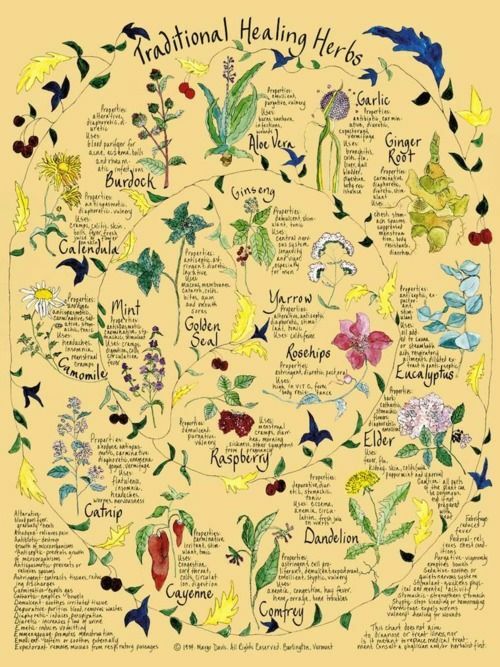 At our homestead we use it as a mosquito and fly repellant in addition to a flavoring for teas. Three of the four kids including myself react harshly to mosquito bites and we have lemon balm growing all over our homestead. Any time one of walks out it is now a habit to grab a handful and rub the leaves all over any exposed skin. This has kept the mosquitoes at bay and prevented us from using any harsh chemicals or pesticides. We regularly harvest and dry the leaves and dehydrate for longer term storage. We also sell plants from our herb gardens to start your own natural medicinal and culinary herb garden. Use the contact us page for purchasing. Catnip is not just for cats. Nepeta cataria has many beneficial properties. While most of us know it for the “drug” we give to our cats to make them loopy for a while and act like a kitten again, it is of use in the garden, for insects, and even for people. 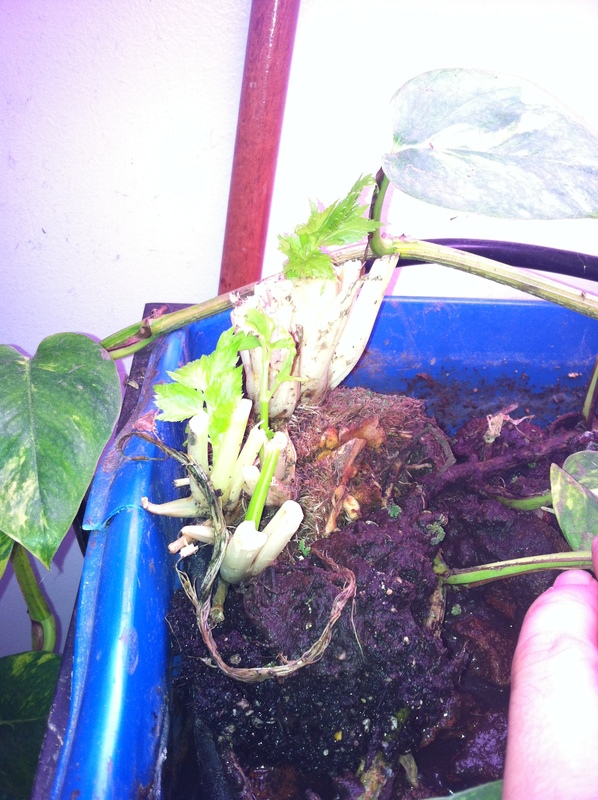 It looks like a member of the mint family but has a square stem with green-grey leaves. The flowers can be purple or pink. Catnip is an attractant to butterflies and cats. 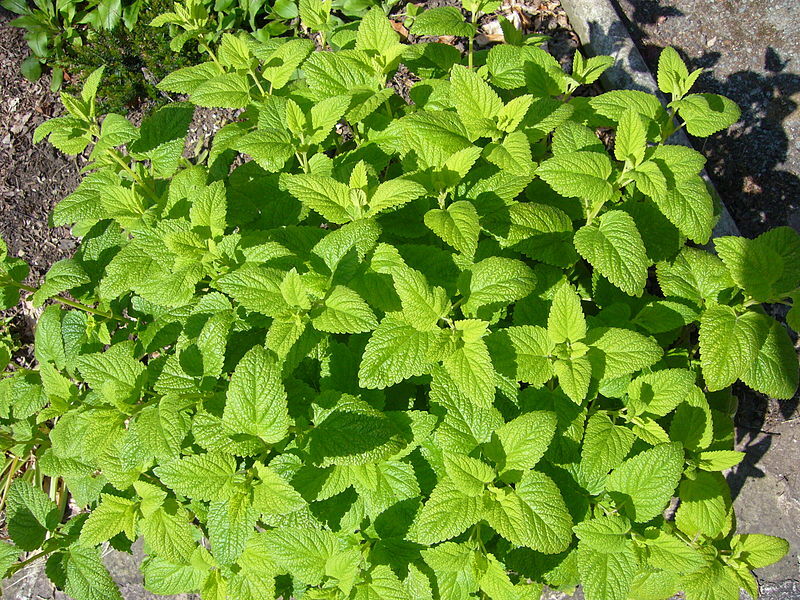 Like my favorite lemon balm, it is also a mosquito and fly repellent in addition to cockroaches, and termites. The chemical terpenoid nepetalactone is the main component of the essential oil which is obtained through steam distillation. Have no fear, you do not need steam distillation equipment to harness the benefits. For fly and mosquito repellant on your person simply pick a few stems and leaves and rub on your skin. Enough pressure needs to be applied to release the oils in the plant. When done it should look slightly crushed and dark green. Research has shown that catnip also attract beneficial insects such as lacewings which eat aphids and mites. 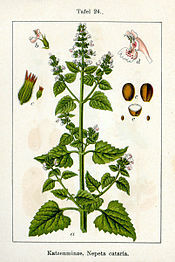 Catnip is drought tolerant, and can also respell certain insects such as aphids and squash bugs. 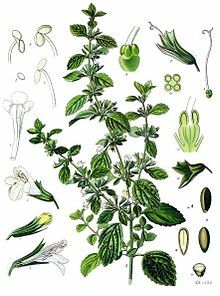 Additional research has shown that the essential oil of catnip is ten times more effective repelling mosquitoes than DEET the active ingredient in most insect repellents. Be careful as catnip can be evasive and spread like mint. To keep it contained you can plant in pots or containers around your garden. It WILL attract your neighborhood cats. You can also harvest it and dry it. Either in a dehydrator, hang upside down in a cool dry place, or even hang outside in the sun. Once dry take the leaves and put in a sealed bag. Catnip has a long history of being used as a digestive aid. It’s a natural sedative that also helps to ease digestion, colic and diarrhea. Dehydration caused by diarrhea, and high body temperatures caused by fevers can be life-threatening. A tea brewed from its leaves may help alleviate these symptoms. 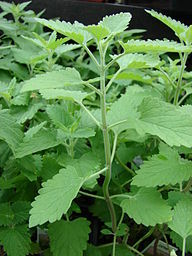 Catnip is also a mild sedative that naturally helps calm the nerves during stressful situations. Herb Blurb – Aloe Vera, a wonder plant. Aloe has many uses beyond the treatment of sunburn. Aloe is loaded with vitamins and minerals. Some people are not aware that you can eat aloe and use it’s juices. Aloe is also loaded with between 18-20 amino acids and contains sterols such as HCL cholesterol which lowers fats in the blood. Aloe Vera is a well-known adaptogen. An adaptogen is something that boosts the body’s natural ability to adapt to external changes and resist illness. Aloe is known to soothe and cleanse the digestive tract and help improve digestion. Because it is a gelatinous plant, it can help remove wastes from the body as it moves through the digestion tract. It is a known vulnerary, (meaning it helps heal wounds) and is great for applying topically to burns, abrasions, psoriasis and even to bug bites. 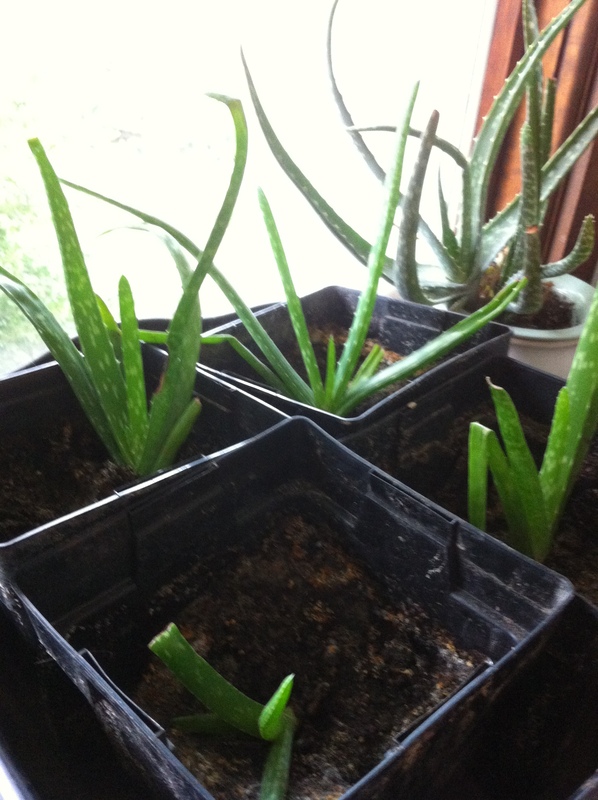 Aloe acts as an analgesic, acting to help relieve pain of wounds. Aloe is a Disinfectant, Anti-biotic, Anti-microbial, Germicidal, Anti-bacterial, Anti-septic, Anti-fungal & Anti-viral. Aloe Vera contains 12 substances, including B-sisterole, which can help to slow down or inhibit inflammation. Improving your digestion, and detoxifying your will have a secondary effect in promoting weight loss. We now have several plants available for sale. $5 per plant. Use the contact us page for details.